The eagerly awaited new Rob Zombie album Venomous Rat Regeneration Vendor will be released on April 23rd and is the first release on his new label, Zodiac Swan, through T-Boy Records/UMe. Zombie’s fifth solo album includes the first single, Dead City Radio and the New Gods of Super Town, along with such tracks as Ging Gang Gong De Do Gong De Laga Raga, Lucifer Rising, Behold! The Pretty Filthy Creatures and a heavy-duty cover of Grand Funk Railroad’s We’re an American Band. 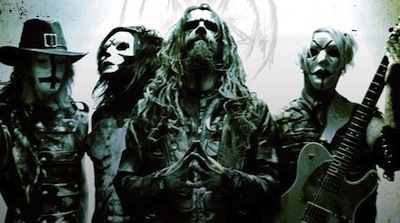 As a musician, Rob Zombie has sold over fifteen million albums worldwide to date. His last studio album was the long-awaited Hellbilly Deluxe 2. The album came a decade after its predecessor, Hellbilly Deluxe, the album that established Zombie as a solo artist after the breakup of multi-platinum group White Zombie. That triple-platinum album also yielded a string of successful radio singles, namely Dragula, Superbeast and “Living Dead Girl,” which dominated the airwaves. The rocker-turned-film director is the only artist to experience unprecedented success in both music and film as the writer/director of five feature films, with a worldwide gross totaling more than $100 million dollars. The week of his album release, Zombie will premiere his sixth motion picture, The Lords of Salem, that he wrote, directed and produced in tandem with the producers of the Paranormal Activity franchise, on April 26, with Anchor Bay Films. Last year, in addition to working on his film, Zombie also dominated the touring world in 2012, blowing away audiences on the road with Megadeth, then with Marilyn Manson for the “Twins of Evil Tour.” Zombie and his band of maniacs – John 5/guitar, Piggy D/bass and drummer Ginger Fish – brought their elaborate, multi-media production, complete with hair-raising theatrics, animatronic robots, oversized LED screens, a non-stop collage of psychotronic monster film clips, a spectacular light show, a gigantic robot with flames shooting out of its body, pyrotechnics, insane guitar riffs and vicious beats to audiences and festivals around the world.